Smart, funny and thoughtful, Zootopia is one of the finest Disney-proper animated feature films in many years. The film isn’t a product of Pixar, the Disney subsidiary, but perhaps the best compliment that can be paid to Zootopia is that it would fit seamlessly in the esteemed Pixar canon. The film lends itself to repeat viewings by audiences of any demographic, including the essential parent-child pairing. It’s a buddy-cop movie, an animal education primer, a movie parody, a coming-of-age flick, and a gateway into earnest discussions about racial and gender prejudice, bullying and cultural inclusiveness. However, Judy dreams of becoming the first rabbit cop in the metropolis of Zootopia. Although predators make up 10 percent of the population, they still occupy most positions of authority, from Mayor Leodore Lionheart (J.K. Simmons) to Police Chief Bogo (Idris Elba), a grouchy water buffalo. So even after graduating at the top of her police academy class, Judy quickly hits a glass ceiling. Bogo assigns her to meter maid duty, and she’s further reprimanded when her successful apprehension of a shifty bandit wreaks more havoc than Bogo deems worthy. But Judy’s upbeat exuberance, and friendship with little lamb Dawn (Jenny Slate), Zootopia’s deputy mayor, soon puts Judy on the trail of a missing otter. 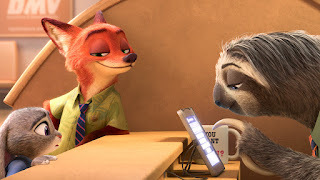 Judy has 48 hours to find the otter or be fired, so she reluctantly enlists the help of Nick Wilde (Jason Bateman, equally tremendous), a cynical sly fox and Judy’s newfound foil. Judy and Nick’s snooping undercovers an epidemic where predators are reverting to their base savage instincts. This plot turn further widens the allegory to mass fear, hysteria and stereotyping. While the issues are weighty, the wit remain breezy and biting. Directors Byron Howard (Tangled), Rich Moore (Wreck-It Ralph) and Jared Bush craft fully realized districts, from Little Rodentia to Tundra Town and the upscale Sahara Square. There’s a running riff on The Godfather involving an arctic shrew crime boss named Mr. Big. A DMV office literally staffed by slow-moving sloths is the film’s comedic showstopper. The whodunit caper drags in parts, and its resolution is a tad tidy and anti-climatic. And the film’s theme song, “Try Anything,” sung by a slinky pop star gazelle voiced by the slinky pop star Shakira, is used once too often and too cloying and synthetic by half. But these are minor quibbles for this amusing “Animal Farm” analog.